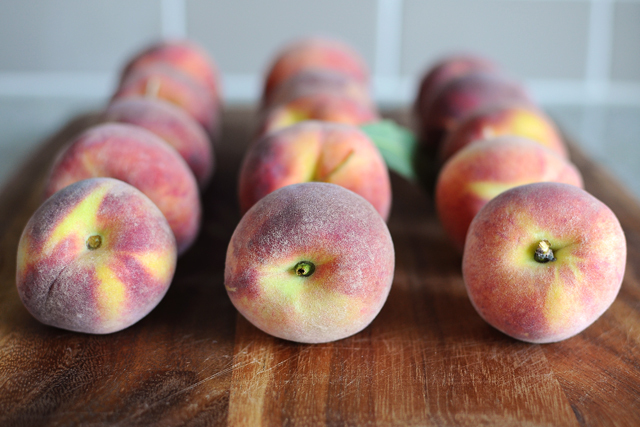 I found wonderful local Texas peaches at the market the other day. I got a little carried away and bought more peaches than we could possibly eat, so I used a good portion of them to make a crisp for dessert. I love a good fruit dessert and this one is no exception. 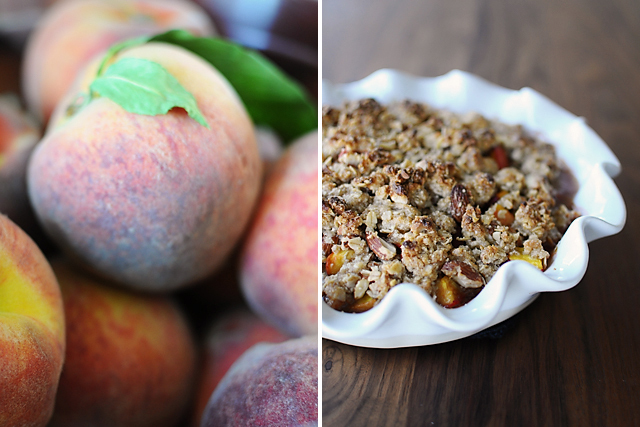 The topping is nutty and crunchy, while the peaches are sweet and perfected cooked. And the great thing about crisps is that they are essentially foolproof. I used almond flour in mine, making it gluten-free, but you could easily use all-purpose flour. Also, feel free to experiment with different fruits, spices, and nuts. This recipe is nothing but a rough guideline, so get creative and adapt it to what you like and what’s in season. In a food processor, pulse the almond flour, turbinado sugar, cinnamon, nutmeg and salt together until combined, about 4 to 5 pulses. Add the cold butter pieces and pulse until the mixture looks like coarse cornmeal, about 15 pulses. Add the almonds and the oats, and pulse until the mixture looks like crumbly sand, about 5 pulses. Spread the mixture onto a small rimmed baking sheet and freeze until solid, about 1 hour. Gently break apart the frozen crisp into large individual crumbs and transfer to a freezer bag until ready to use. The crisp topping can be frozen for up to 1 month. Heat the oven to 375 degrees with the oven rack in the lower-middle position. In a medium bowl, toss the peach chunks with the sugar, lemon zest, and lemon juice. 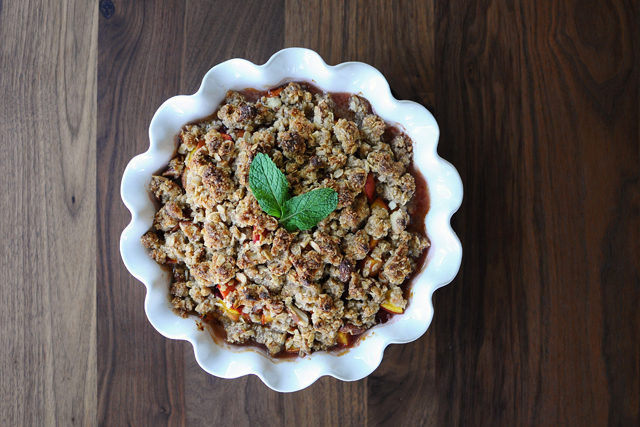 Transfer the fruit mixture to a 9-inch pie plate (or similar sized dish) and sprinkle with the frozen crisp topping. Bake for 40 minutes, until the fruit is bubbly and the top is nicely browned. Cool for a few minutes before serving. Best eaten warm with a scoop of vanilla ice cream. Makes enough for about 6 people.